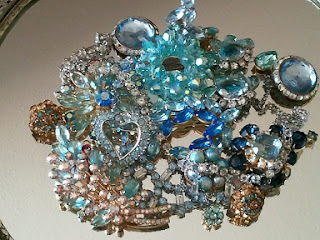 Some of our Aquamarine treasures! If you can picture the cerulean blue waters of the Mediterranean, you will understand why the birthstone for March is named Aquamarine. Derived from the Roman word "Aqua," meaning water, and "mare," meaning sea, this pale blue gem does indeed resemble the color of seawater. The ancient Romans believed that the Aquamarine was sacred to Neptune, the god of the sea, having fallen from the jewel boxes of sirens and washed onto shore. Early sailors wore aquamarine talismans, engraved with the likeness of Neptune, as protection against dangers at sea. The association with water led to the belief that the Aquamarine was particularly powerful when immersed. Water in which this gemstone had been submerged was used in ancient times to heal a variety of illnesses of the heart, liver, stomach, mouth and throat. Aquamarines were also used to reverse poisoning and to aid in fortune telling. The Aquamarine is a member of the beryl family. Beryl is a mineral that crystallizes within large grained igneous rocks on the earth's crust. It varies in color from clear to vibrantly colored gemstones such as the Emerald. Beryl was used as far back as 2,000 years ago to correct vision, and it continues to be used today in the manufacture of eyeglasses. It is a very hard mineral, making the Aquamarine a durable gemstone for use in jewelry. Aquamarine varies in color from blue-green to a light sky blue, but gems containing green are often heat-treated to remove this less desirable color. The majority of Aquamarines, unlike other gemstones, are flawless. It is a relatively abundant gem, the largest deposits being in Brazil, but other sources of Aquamarine are in China, India, Australia, Africa, and the United States. A gift of Aquamarine symbolizes both safety and security, especially within long standing relationships. Some people even say that the Aquamarine reawakens love in a tired marriage, so if you want to bring back that spark in your partner's eyes, you might consider this gem as an anniversary gift!